There is nothing more breathtaking than the sight of an eagle soaring overhead or swooping down to catch its prey. Wisconsin is fortunate to have bald eagles, our American symbol, nesting in our state. At one time, eagles in Wisconsin were in danger of becoming extinct. Bald eagles have made a comeback thanks to the hard work of many citizens, natural resource professionals and organizations over the years, including DNR’s Natural Heritage Conservation Program. The annual Wisconsin Bald Eagle and Osprey Nest Survey shows a healthy and growing population . promote awareness of bald eagles. We greatly appreciate your generosity, and to show that we'd like to send you the following gifts. 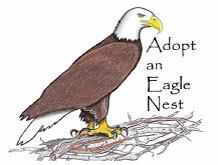 An adoption certificate with the name of your choice, certifying that you have adopted an eagle nest in the state of Wisconsin. An aerial photo showing the location of your eagle nest. Near the end of each calendar year, you will also receive the following additional gifts. The results from the previous year's eagle and osprey surveys. Please enclose a check made out to "Endangered Resources Fund - Eagle Nests." Minimum contribution is $100. Please include the address of the recipient and the name and address of the donor (if they are different).